Trinity Beach Dental offers affordable in-house root canal treatments. The word ‘endo’ refers to ‘inside,’ and ‘dontic’ means ‘tooth.’ Endodontic therapies involve treatments that impact the nerve inside of the tooth’s root canal chamber. Your treatment will begin with Tony numbing the tooth and nerves around it. Then, he will remove the infected nerve and medicate the inside of the tooth. After the canal is filled and sealed off, it is recommended that you have a crown placed over it (as the tooth can become brittle). 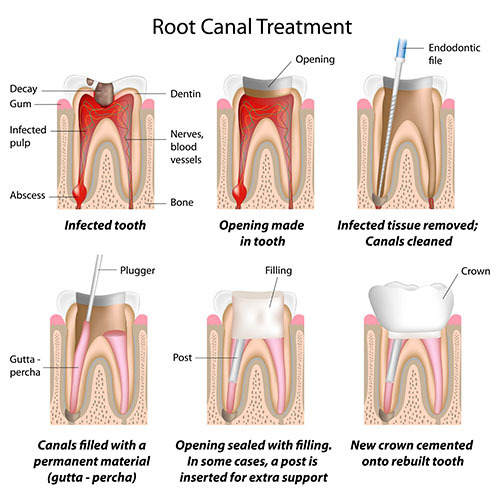 Depending on your situation, root canal procedures can take one or two appointments to complete. A prescription may be necessary if a severe abscess is present. Yes, There Is Such a Thing As a Gentle Root Canal! Getting a root canal doesn’t have to equate to a painful procedure. Tony truly takes his time to ensure that you are as comfortable as possible throughout the process. You can even request nitrous oxide to help you relax. We’ll never rush you through, but truly take the time needed to make the experience a positive one. Is your tooth hurting? Are you in pain? Contact us today to arrange an exam with our dentist. New patients are always welcome!